The creation of the Virtual Pavilion project at NASA Goddard Space Flight Center. 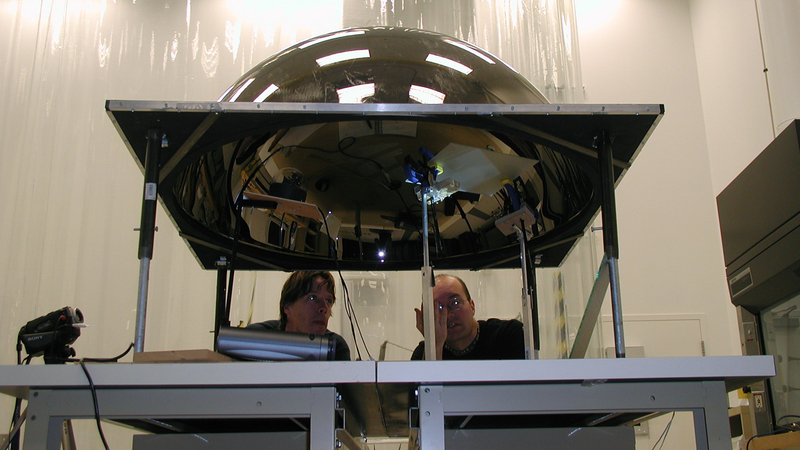 From left to right: Gregory Kuhn (installation designer) and Joe Howard (optics engineer) are working on the spherical mirror used to project manipulated images via the network. The project included software and hardware engineer Wesley Smith, not pictured. This paper describes the research and theory behind a multimedia installation currently in-progress, The Pavilion, inspired by the seminal Pepsi Pavilion created by E.A.T. (Experiments in Art & Technology) for Expo ’70 in Osaka, Japan. Like the original, The Pavilion employs a concave spherical mirror situated in an audio/visual environment, engaging viewers in a participatory experience that collapses their perception of time and space. The project explores the composition of musical and visual forms that extend the transformations of the mirror space to the virtual architecture of the Internet. It also investigates the dislocation of the viewer experience brought about by the blurring of boundaries between physical and network space.